Mental health, non-suicidal self-harm, and suicide themes on social media continue to be an issue both youth and adults face on a daily basis. Experts recognize that youth engagement with social media includes positive and negative aspects and our goal is to help maximize the benefits while reducing any potential harm. How much do you know about current social media trends and uses? What apps and websites are popular with young people? Which platforms are your kids using and how many accounts do they have? Which platforms do they use to talk with their friends and which ones are more for recreation? Parents need to have tools for these conversations. The American Association of Suicidology has teamed up with physicians and subject matter experts to put together a list of tips and recommendations to help. 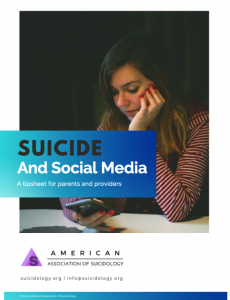 Suicide and Social Media: A Tipsheet for Parents and Providers provides direction to parents to monitor their children’s use of social media by being aware of popular apps, websites and accounts among youth. Download the tipsheet. The American Association of Suicidology’s mission is to promote the understanding and prevention of suicide and support those who have been affected by it. Founded in 1968 by Edwin S. Shneidman, PhD, AAS promotes research, public awareness programs, public education and training for professionals and volunteers. In addition, AAS serves as a national clearinghouse for information on suicide.